Since everyone has been talking about drugstore beauty products and purchasing them in place of spending big bucks on expensive makeup and skincare, I thought I would join in on the fun and discuss my opinion! As you probably know I am not a big makeup person. I believe in minimal makeup and clean skin. 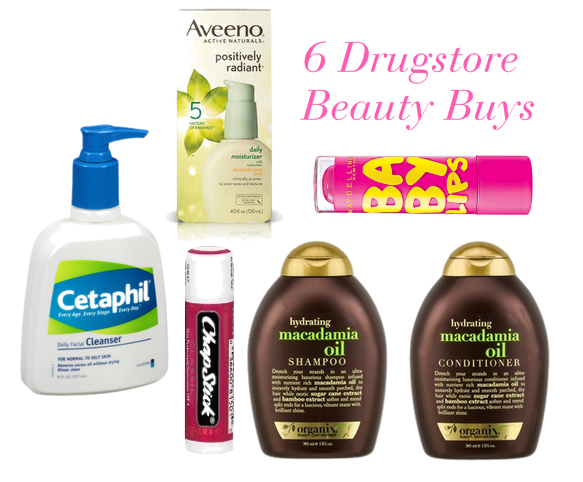 That being said, here are 6 of my favorite Drugstore Beauty Buys! Cetaphil Daily Facial Cleanser is the only soap I trust on my face. It leaves my skin soft and silky! Aveeno Daily Moisturizer is what I use when I have a little patch of dry skin or need SPF on my face for the day. It smells delicious and super natural too! Maybelline Baby Lips in Pink Punch is actually the best lip butter out there. The pink color is neon but natural at the same time. A must have! Cherry Chap Stick is something I use every day, and multiple times at that. Once when I wake up, usually at some point in the middle of the day and right before bed to moisturize throughout the night. Organix's Macadamia Oil Shampoo and Conditioner is what I have been using to wash my hair nearly this entire year and I love it. I have thick dry hair and the ends in particular really get rather dehydrated. I would imagine it would be really hydrating for all hair types though and recommend you give it a try! Now, let's hear it: what are your most favorite beauty buys from the drugstore? I love Organix's shampoos! I usually go with the Coconut. Also Q-Tips. I can't get enough of them. I use them for everything. I have really sensitive skin, so I use Simple prodcuts- they're the best! !